So here's a secret: We're developing a widget that allows you to publish the Today devotional on your own website. Check out the Today widget page and try it yourself! My friends at CHANGEffect have been running a Six-Word Story contest. What story can you tell in six words? My six-word story was nominated in the top ten, so GO VOTE FOR "Seeing God's Story in My Life". It is actually an adaptation of our new tagline at ReFrame Media, Seeing Gods Story in Your Life. What we do in the English Language ministry of Back to God Ministries Int'l is invite people to experience more of God's action in their lives, and when God's story gets poured into your life, it changes your perspective on everything. God ReFrames your Life, so to speak. So go vote for my story! How do you think, Christian? I'm quite excited to announce that Back to God has recently acquired www.ThinkChristian.net, a blog exploring the intersection of faith and daily life. TC has been part of the Gospel Communications (www.Gospelcom.net) lineup of Internet ministries for the past two years or so. As of the fall of 2008, GospelCom has been transplanting several of their ministries to other organizations as a cost-cutting measure. Several websites, including the Bible Gateway and Gospel.com, have been sold to Zondervan, for example. It's well known that the American sytem of electing a president involves entire states going completely to one candidate or another. But some scholars at UofM have mapped the election results county-by-county, with the color of the county (red, blue, and shades of purple in-between) indicating the strength of the political leaning, and the size of the county indicating relative population. It is then a more accurate visual mapping of the political leanings of the american populace for presidents. Note how most of the country is purple. The strongest Democratic centers are on the caosts and major cities. We're launching a new project at the Back to God Hour, called Walk the Way. It's a conversation on how Jesus followers can live out their faith in real life. Here's a preview. Keep an eye on walkthewway.net for more. I made a movie with some of my friends from Calvin Sem and Jibjab. Hope you enjoy it! Albania is an amazing place, a blending of cultures as diverse as Eastern Islam, Soviet Communism, Ancient European mystique, Mediterranean leisure, and emerging Evangelicalism. Here are some notes I sent home during my week-long stay. Sorry for not touching base with all of you sooner. While this is a pleasant place, there is little connectivity. We have no phone, no car, and no Internet where we are staying. But we are staying at a couple of lovely guest houses in a touristy beach area. It feels rather like Mexico, with Mediterranean buildings, cottages, hotels, shops and pubs crammed into a patchwork of dirt lanes near the beach along the Adriatic sea. We have both nice hotel/restaurant and ramshackle open-air markets nearby. Parrot-like birds scream in the trees, and three-legged stray dogs wander about searching for scraps. Our first day saw a visit from a local pastor to share with us the fascinating Albanian religious landscape. This land is called Illyricum in the New Testament, where the Timothy and Titus preached once upon a time. It has a rich Christian history, largely overshadowed by centuries of Islamic rule through the middle ages. After WWI, Albania was carved up by Europeans, giving provinces like Kosovo and Montenegro to other states. After WWII, this was a communist dictatorship under Soviet influence. They've had decades of Atheistic imposition. In 1967, the dictator declared all religious buildings should be destroyed. He said "Albania has no need of God." What religion did survive was deeply rooted in Greek Orthodoxy, Roman Catholicism, and especially Islam. The Protestant Reformation largely missed this place, so there is little Evangelical presence here. Radio 7, our hosts and the station on which our programming is heard, has a difficult time explaining it's theological identity to fellow Albanians, since most folks have no point of reference for Protestants. “Evangelical” sounds about the same to them as Mormons, Jehovah Witnesses, or the Moonies. Yet since 1991, there has been renewed interest in Albanian religious heritage. A whole generation began to ask, "who are we? From where have we come spiritually?" Many have reclaimed some religious heritage, but only in an ethnic sense. Many identify themselves as Christian or Muslim only because their families were once one or the other. It’s more a clan thing than a worldview. So Radio 7 was begun in 2002 by some young Christians to bring an evangelical voice to the people and help people find their true identity in Christ. Our programming in English is played every day at 3pm. A large mountainous Roman province in the northwestern Balkan Peninsula. Illyricum incorporates the territory along the eastern coast of the Adriatic Sea from Macedonia to Italy and west to the Danube River. The exact boundaries of the territory fluctuated over time. Ancient Illyrian tribes had the reputation of being wild, and they often took up piracy. The Greeks attempted unsuccessfully to colonize the coast from the 6th century b.c.e., thwarted by both geography and the native people. The name of the region comes from one of the first tribes encountered by the Greeks. The Illyrians were defeated but not subdued by Philip II of Macedon. The Romans incorporated the full area into the empire in the 1st century c.e. under Tiberius (14-37), but it had taken them 250 years to subjugate the Illyrians, including two wars (229-28 and 219 b.c.e.). In 148-47 the southern districts were united for a time with Roman Macedonia and were thus under Macedonian jurisdiction. Augustus made Illyricum a senatorial province in 27 b.c.e. and an imperial province in 11 b.c.e. In the 1st century c.e. it was divided into the provinces of Pannonia in the north and Dalmatia in the south. Paul claims to have “fulfilled” the gospel of Christ in the geographic circle from Jerusalem to Illyricum (Rom. 15:19), but it is unclear whether he preached in the province or whether it was the eastern boundary of his missionary activity. Illyricum is probably again referred to when Paul indicates to Timothy that Titus is working in Dalmatia (2 Tim. 4:10). Freedman, D. N., Myers, A. C., & Beck, A. B. (2000). Eerdmans dictionary of the Bible (631). Grand Rapids, Mich.: W.B. Eerdmans. Our second day has been about catching up with the past year's activities among our partners. We BTGH folk talked about our NRB experience and what we learned from it. Theo from FEBA presented her externship with a development agency in Nepal, where we are now on at least three stations. Some of our key training this year is coming from Bob Fortner based on his new book on a Christian theory of communication. He suggests that too much religious broadcasting is based on what we want to say and the ways we want to say it, regardless of what a listener might need or how a listener might best hear. This approach is rooted in a bad communication model. One cannot assume that just because you transmit something it will be received well. Ultimately, it's a selfish approach. We can be self-satisfied that we said what we wanted, and that's all that counts. A more academically useful (and biblically-based) model is self-sacrificial and personal. Just as God came walking in the garden, calling out questions to people he already knew were lost, so we seek to offer good news to the needs and questions our listeners already have. Further, we do so as people who care about and legitimize our listeners as valuable people. Ultimately, I think this is about coming along side people, whether already Christian or not, and walking alongside them in the direction of Christ. We continued our discussion over Integral mission, a listener-sensitive communication model, and some implications for Spotlight. Then we took a chartered bus to the town center (Durres). There we toured the statue of the patriot, a mediaeval castle, and ruins of a Roman amphitheater, forum, and bathhouse. 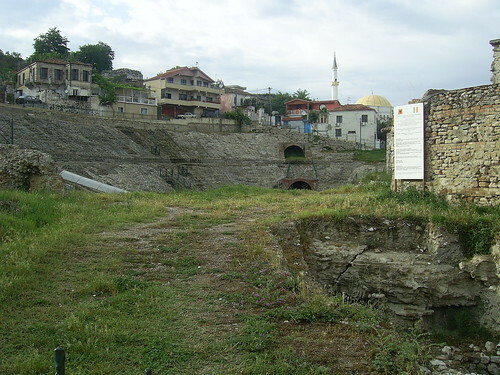 The amphitheater held a Byzantine chapel used for funerals after the theater became used as a graveyard. Inside the chapel are very rare Christian mosaics, which are surprisingly open to the public, They were behind a couple locked gates, but some bent on destruction could easily destroy them if they so wished. Ramshackle houses now surround the theater, with a gold-domed mosque dominating the neighborhood. There's something significant in the Roman ruins, encasing Christian modifications, all lying in the shadow of the mosque. That somehow seems like a simile for Albania's religious condition. The next day we drove to the ancient capital and castle stronghold of Albania, which is also home to a Albanian Muslim sect. Albania's key story of origin, the story they tell to describe how they became a country, focuses on a 14th century warrior king who united the princes and threw out the Ottoman Turks for 25 years. His name and image are the first symbol for Albania except for the double-headed Eagle. Near the castle is a 16th century market/bazaar full of trinkets and antiques. Everything here seems to be made of concrete. All buildings--homes, hotels, restaurants, shops, car washes, police stations--they're all made of the same materials and built in a similar concrete block style. They tend to be painted in bright primary colors to balance the fact that they all look like bomb-shelters. We then visited the University in the capital of Tirana, the highlight of which was the Albanian and American flags draped over the former KGB Headquarters in honor of George Bush's visit this weekend. After a lunch at a McDonalds look-alike (complete with look-alike burgers that were not quite ground beef), we came to the headquarters of Radio 7 Albania, It's the third most-powerful station in the country, but evangelicals account for less than 1% of the population. Since the church in Albania is less than 30 years old, the Christians here tend to be younger, so this stations is programmed by young people for young people. As I type this, we are at the studios listening to our own Spotlight program going over the air, with Albanian bookends opening and closing the program. It's targeted to high school and college students shortly after school lets out. Some of our team has been doing focus groups with listeners of different groups of listeners. Yesterday they spent time at a language school with 7 & 8 year-olds to see how our programming played to a younger crowd. They like the sound effects, but since they had less than a year of English training, I suspect a good deal of the content went over their heads. I have many photos which I'll upload when I get a better Internet connection. It's been a busy couple of days. We left Radio 7 on Wednesday and drove up to the mountains. First, we took a cable car lift up the face of the mountain and into the clouds. From the car we could see city scape vistas, shear rock cliffs, shepherds and their sheep, houses perched in improbable places isolated by improbable heights. Soviet-era pillboxes ready to defend the mountain from invasion, all before we ultimately disappeared into the cloud cover draping the mountain top. At the top, we took a van to a massive restaurant, complete with it's own tiered trout ponds built into the hillside. After a particularly good dinner of roasted rabbit, we stopped on our way back to the cable car to inspect the Radio 7 antenna farm. It rather looks like the BTGH logo. From this perch they achieve one of the largest radio footprints in the country. Thursday was a long and productive day of conversation and meetings. Bob Fortner spent some more time talking about radio audience research and cross-cultural sensitivity. We discussed at some length our web site design and traffic patterns. As we looked over the numbers, we were surprised to realize that our eastern European web traffic has spiked significantly in the past six months, even though we don't have much broadcast coverage there. It seems the web is being used as it's own content delivery medium. We've been laying many plans for expanding our Spotlight websites, but have lacked the personnel to drive the development. We're hoping that recent staff changes among the partners will allow us to gain some traction over the coming year. We also listened to a pilot of the Corner Stories program, which tells basic Bible stories in SE. We have struggled for months with the right target audience for this program, so we discussed the possibilities with the group. We discussed many open questions, ultimately concluding that we need more audience research rather than our poorly educated guesses. Bob & Christy are leading two such groups this Saturday. The Radio 7 team also provided some insight, suggesting they too saw it as a children's program primarily, so they would like to see be shorter and leave opportunity for local translation. After our general meeting, Mike P, Christy, Bob, and I conferred on some administrative details. We were amazed how staffing losses for one partner have been repeatedly mitigated by another. WOH has just lost their web developer, for example, while we at BTGH have just added one. That's part of the key value of our partnership. It also looks like we may well host the SE conference 2008 in Chicago so all the new staff can see the BTGH HQ (and all the Americans can save a few dollars in travel costs!). It's not yet set, but that's the inclination. After dinner, we all went to bed, but Roni and I were up at 2.30am to head for the airport. I have about 24 hours of travel today! The rest of the team has more training and reviews of past programs for some analysis and improvement on Friday, and Saturday they will be meeting listeners and conducting focus groups. And then they all will climb in a bus at 3am for a ride to the Airport early Sunday morning. Sitting here in the Milan Airport, I'm uploading all my photos to flckr.com. We'll be setting up a group flickr page where all the SE folks will share their photos. I suspect we'll have a couple hundred. But you may start with these! It's official. I am now the English Language Ministry Leader for the Back to God Hour. That means I'm responsible for all the programming we produce in English, for both North American and International audiences. So, not only will we continue producing our 60-year-old flagship Back to God Hour program and the Kid's Corner children's program, we are also developing new shows. Our first project targets an English-as-a-second-language audience. The beauty of it is that we write the show in English, but can broadcast it everywhere. We are just beginning to relaunch the English ministry. It's exciting stuff, with more to come! That also means my family is now resides in the Chicago area. At least it's much closer to home than Boston! One of these headshots will be coming soon to a Banner issue near you! Here are some sample sermons I have preached. These are large files, so they may take some time to download. Note that some have gaps due to the original audio casette switching sides. If just clicking the link doesn't seem to work, try right-clicking for the menu and choose "Save Target As..."
Enjoy! I pray they are a blessing to you!